Warrington will head into their elimination semi-final against St Helens on the back of a morale-boosting victory over Wakefield Trinity at the Mobile Rocket Stadium. 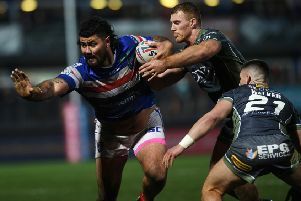 The Wolves were made to work hard by a committed Trinity side who were seeking to confirm a fifth-place finish in Super League for the second year running. But a four-try second half haul was enough for Steve Price’s men to notch the 13-point win. Declan Patton kicked a perfect six from six goals and grabbed a try to see the visitors home. Tyler Randell got Trinity on the board when he broke through some weak defence after just three minutes to score. Ryan Hampshire added the extras to put them 6-0 in front, but Warrington hit back through Ben Murdoch-Masila. Patton’s conversion tied it up at 6-6. However, that was short-lived as Joe Arundel crossed to give the home team back the lead. Jacob Miller’s cut-out pass put the centre over and Hampshire converted from the sideline before tagging on a drop goal to make it 13-6. But in a crazy end to the first period, the Wolves then won the ball back from the short kick-off and made Trinity pay, with a Toby King converted try. Warrington edged ahead with tries from Stefan Ratchford and Jack Hughes, before a Hampshire try cut the deficit to just five points. Patton responded in quick fashion with a try of his own, but Trinity would not give up and winger Ben Jones-Bishop was the next to get on the scoresheet. But Warrington had the last say with Atkins intercepting the ball to stroll over. Wakefield: Jowitt, Tupou, Lyne, Arundel, Jones-Bishop, Miller, Hampshire, Pauli, Randell, Arona, Ashurst, Batchelor, Crowther. Substitutes: Wood, Huby, Horo, Annakin. Warrington: Ratchford, Atkins, Goodwin, T. King, Charnley, Livett, Patton, Hill, Clark, Cooper, Hughes, Murdoch-Masila, Westwood. Substitutes: Philbin, G. King, Akauola, Smith.